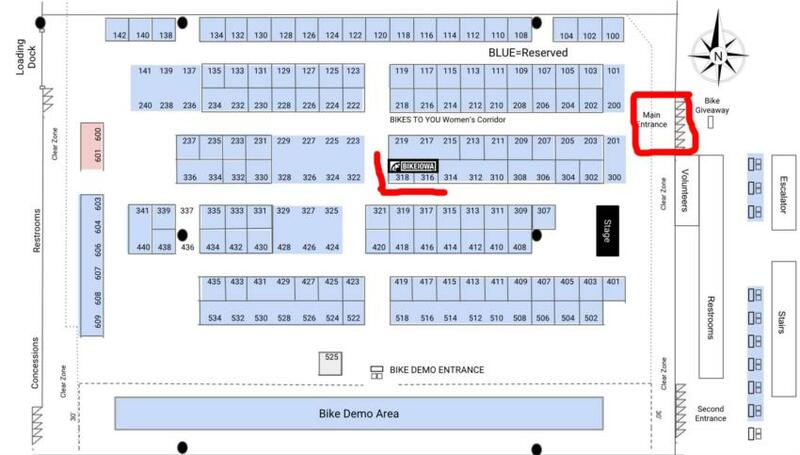 Iowa Bike Expo is one of the biggest one-day bike shows in the Midwest. This free-to-the-public event hosts over 5,000 people. 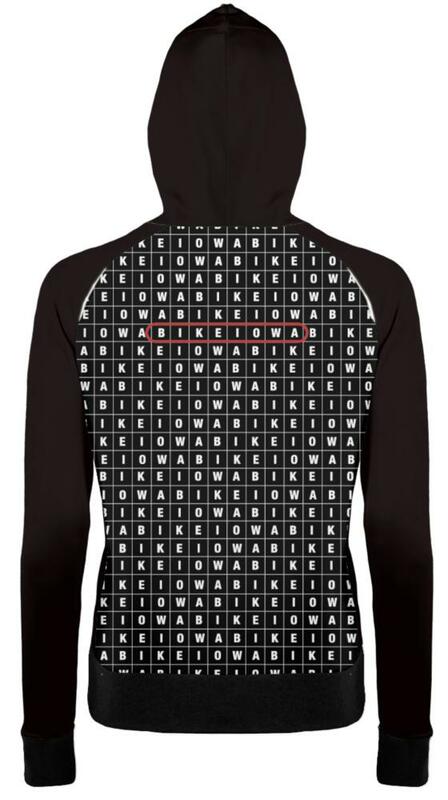 Check out the new BIKEIOWA gear! We are SET and we look forward to seeing you this weekend. 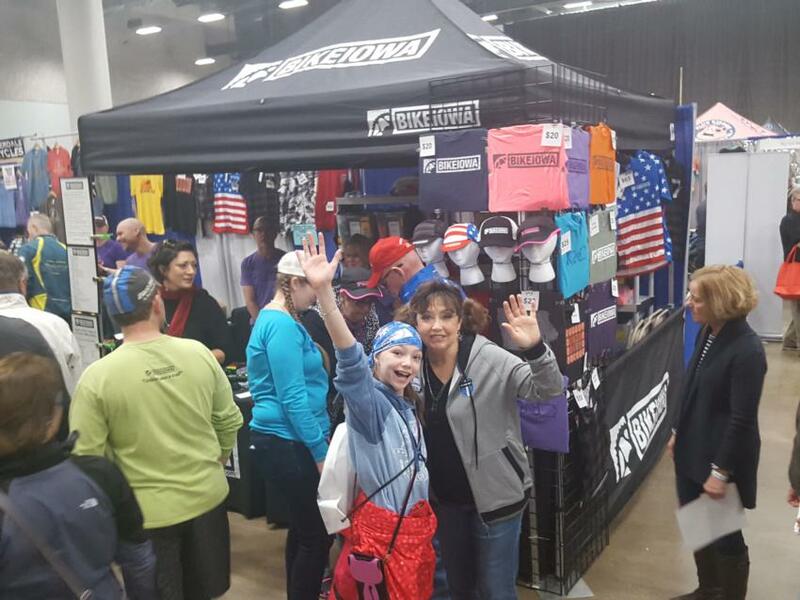 The Iowa Bike Expo is one of the coolest events in the Midwest. Each vendor is someone who you really want to see versus just passing by. There will be plenty of Bicycle Shops with the latest and greatest as well as plenty of Iowa Trail Destinations. Check out the 2019 Exhibitor List. 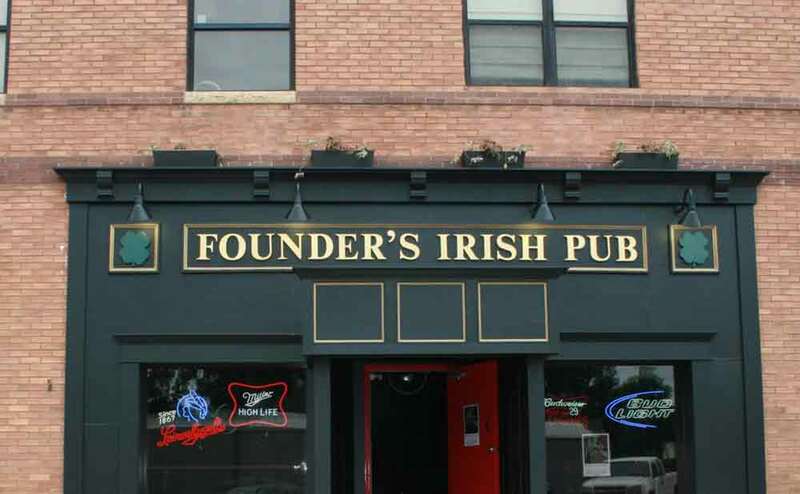 Be sure to stop down and allow yourself plenty of time to browse! Then we'll all party at the RAGBRAI Announcement Party later that night! We have too much lycra! Our BLOW-OUT SALE will clearance out a *ALL* Jerseys, Crew Shirts, and Women's Tanks. Prices will DROP from $65 to $50 !!! So - Be thinking Summer - That $15 dollars you save this Winter can be spent on a nice bike ride this Summer. Look for the "BLOW OUT " signs! We'll be bringing everything we have listed on the online store (Jerseys, Crew Shirts, Tank Tops). Most T-shirts and Tank-tops will be $15 versus $20 too! - Check out the T-shirts, Tank-tops, Caps, Socks, Patches and Hoodies. Looking for long-sleeves - We have those too! Some sizes and styles are limited. Note, the online store does NOT reflect the sale pricing that will be offered at the expo nor is any of the new gear below on the online store. 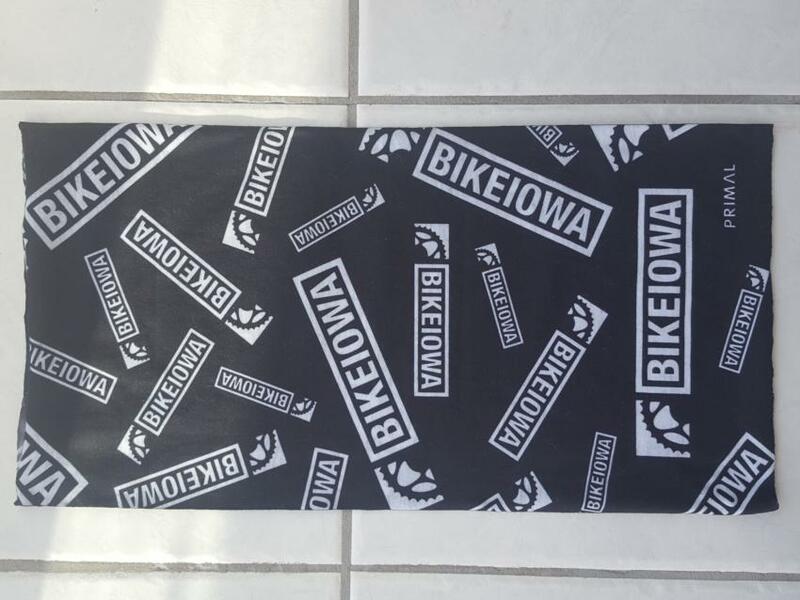 We always try and offer something unique and cool for the Iowa Bike Expo. 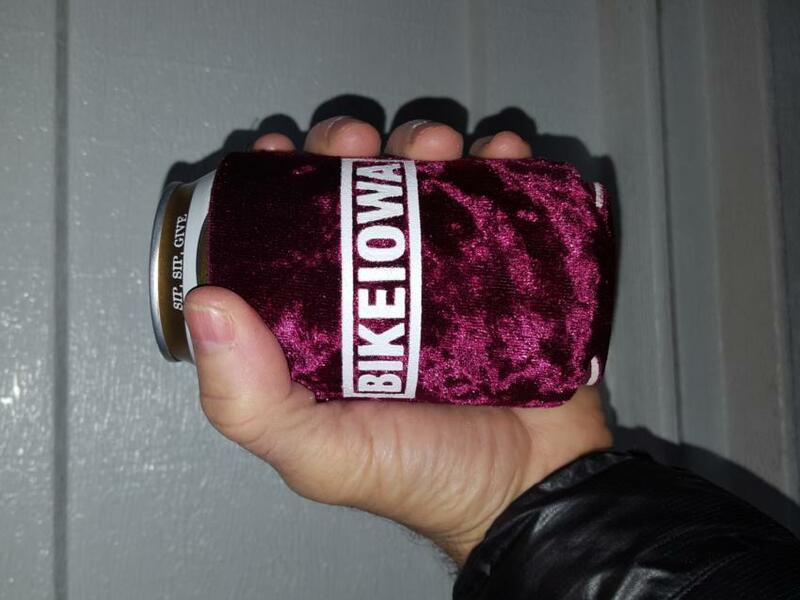 If you know us, you know that we like to create small batches of unique and cool BIKEIOWA Gear for the Iowa Bike Expo. We LOVE to create something new. We LOVE the creativity and we LOVE that YOU like to wear apparel that "not everyone else has", so once they are gone, they are gone. 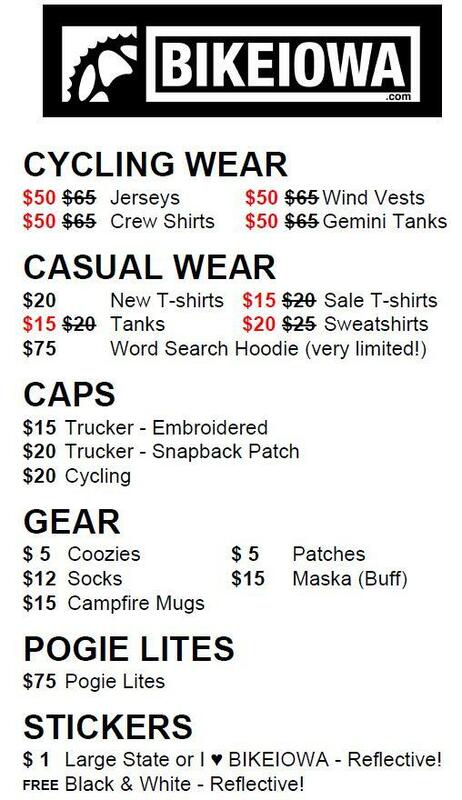 We've learned that folks are not thinking about jerseys and tank tops in January, so we don't debut any new lycra until early Summer in preparation for RAGBRAI, so that's why we are offering a blow-out sale to make room for new lycra later in the year. 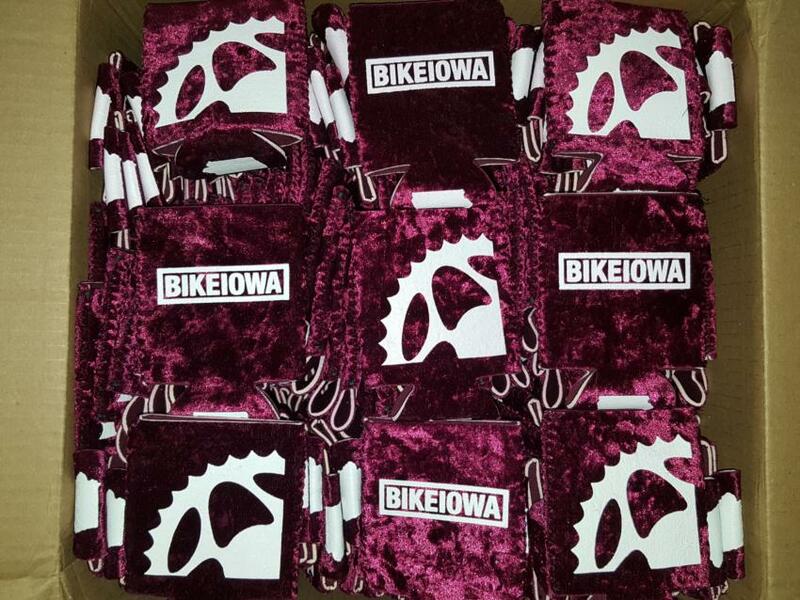 If we have any leftovers of the new gear after the expo, we will post to the BIKEIOWA store later in the week. The inspiration for this T-shirt was from the "Rub-A-Dub-Dub" Nursery Rhyme that was published in the 18th century. We gave it a little cycling flair, and guess what, It still rhymes! 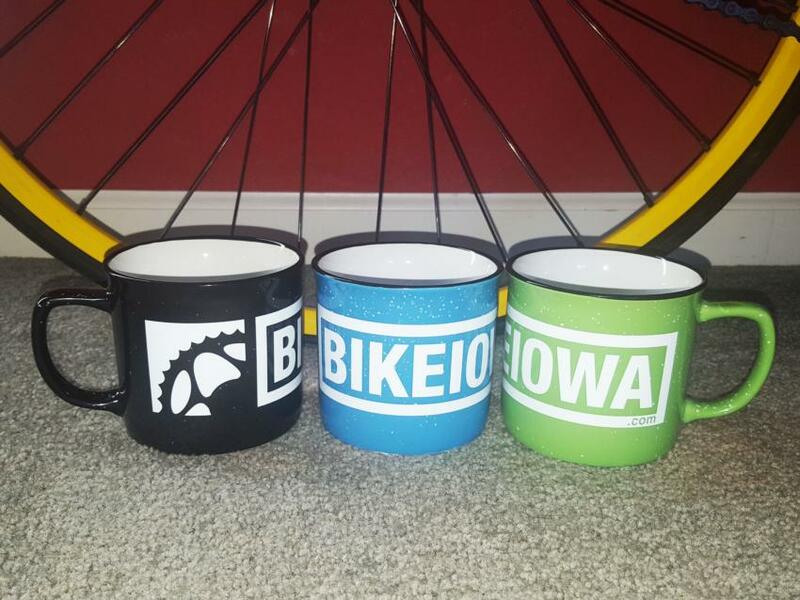 Our new campfire mugs have a nice heft with the BIKEIOWA logo wrapping clear across the mug. These 15 ounce ceramic/stoneware mugs come in three colors: Black, Green and Blue. (Expo Price - $15). 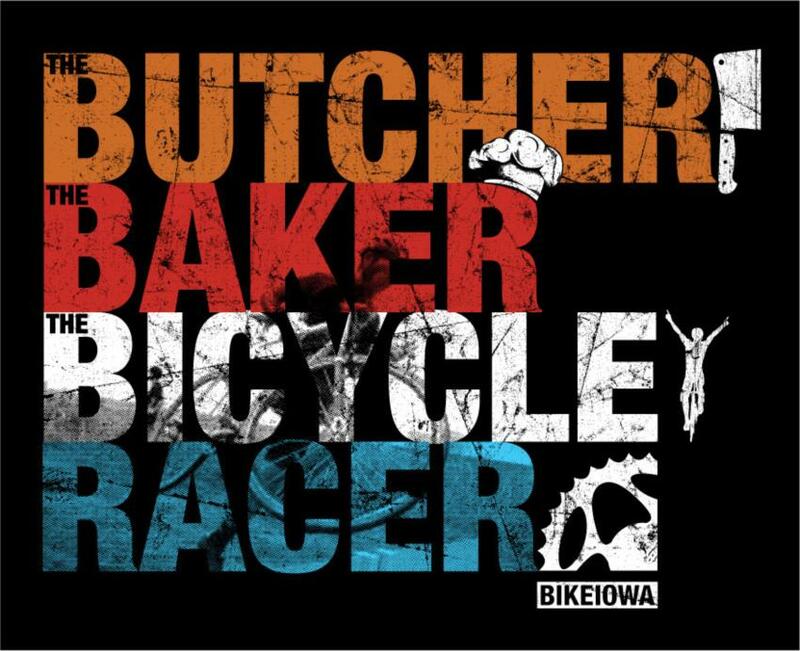 Thanks to our friends at Bike Rags for making these! We'll have over 100 caps of different colors and styles available, but most are in lots of 10, so you'll still be unique out there in your worldly travels. (Expo Price - $20). Thanks to our friends at Bike Rags for making these! Here are the limited colors and quantities: Red White Blue (20), Black/Charcoal (10), Black/Gold (10), Charcoal/Neon Blue (10), Purple/White (10), Loden/Black (10), Gray Charcoal Black (10), Charcoal/Neon Green (10), Charcoal/Neon Pink (10), Dark Green/Gold (10), Hot Pink/White (10), Heather Gray/Black (10), Charcoal/Yellow (10), Black Digital Camo (10), Charcoal/Columbia Plaid (10), Red/Charcoal Plaid (10), Thyme/Green Plaid (5), Krytek Typhon/Neon Pink (5), Dark Green Plaid (10). Constructed with 100% Polyester Microfiber, the Maska controls body temperature by wicking away sweat, keeping you dry. The fabric is soft to prevent irritation as it comfortably protects your face and neck. 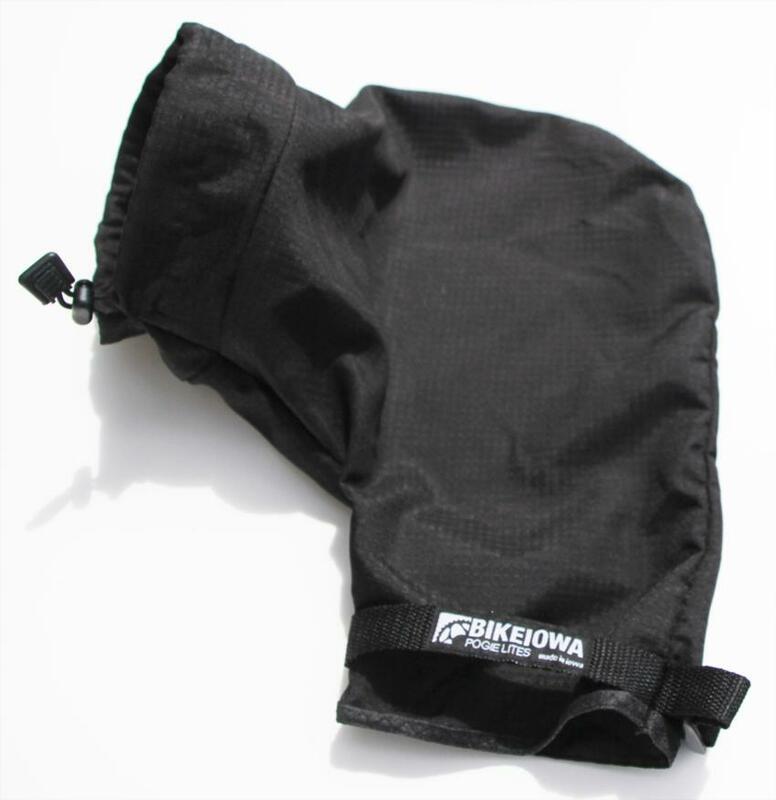 The Maska gaiter is perfect for cooler weather and withstands all those pain-in-the-neck cycling situations you find yourself in. Thanks to our friends at Primal Wear for making these! Want something unique? 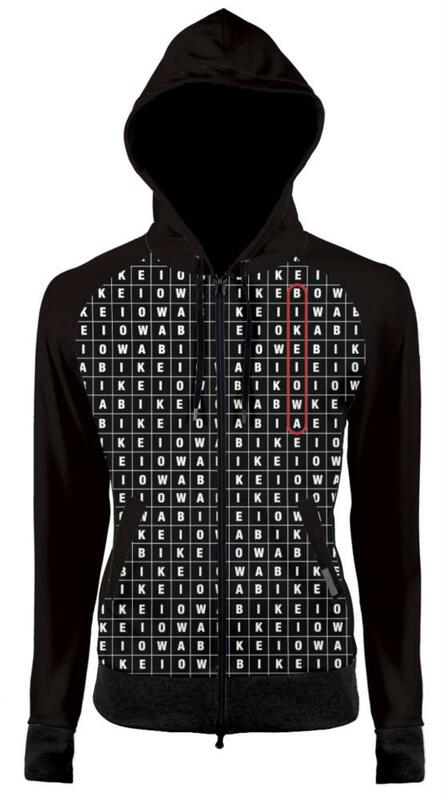 Find your passion with our 'Word Search' Technical Hoodie with dual reflective zipper and thumbholes too! We took pre-order in December and ordered a few extras, so we literally have 8 of these. (Expo Price - $75). Thanks to our friends at Primal Wear for making these! 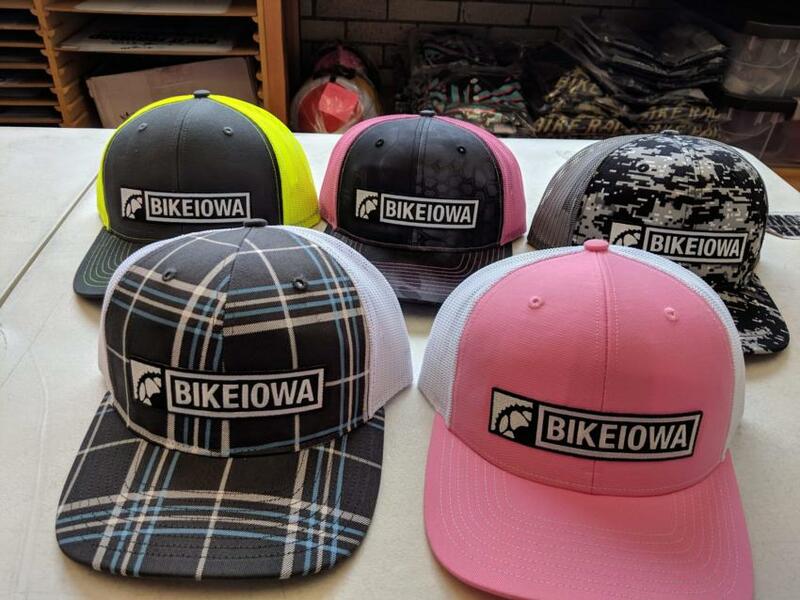 We'll have 100% of our online inventory at the Expo, but feel free to check out the BIKEIOWA store to see the styles and sizes. So you'll still be able to purchase jerseys, crew shirts and tank tops along with trucker caps and coozies and save on shipping. Note: none of the new items are added to the online store. We will also shut down the online store before the expo and will re-open it later in the week after the expo so we can re-inventory everything. We'll have a laptop and plenty of ears if you want to talk bikes, advocacy, trails, or just about the site. We love to hear your ideas and feedback to help us make BIKEIOWA and biking in Iowa better. 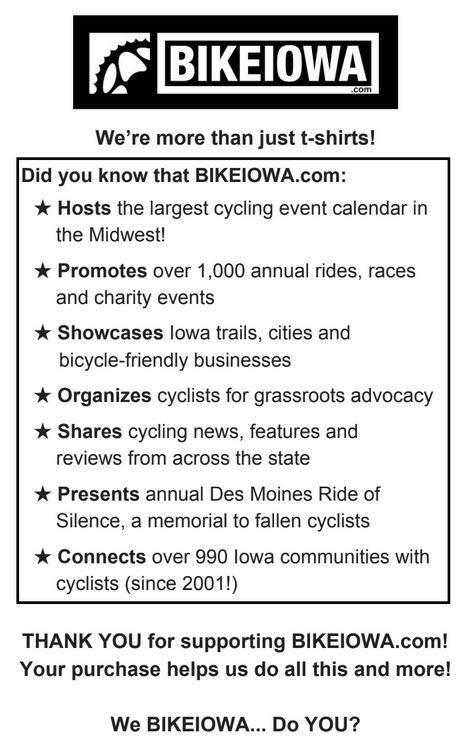 THANK YOU for supporting BIKEIOWA.com! Your purchase helps us run the site, donate to good causes and give swag and prizes to all sorts great events! 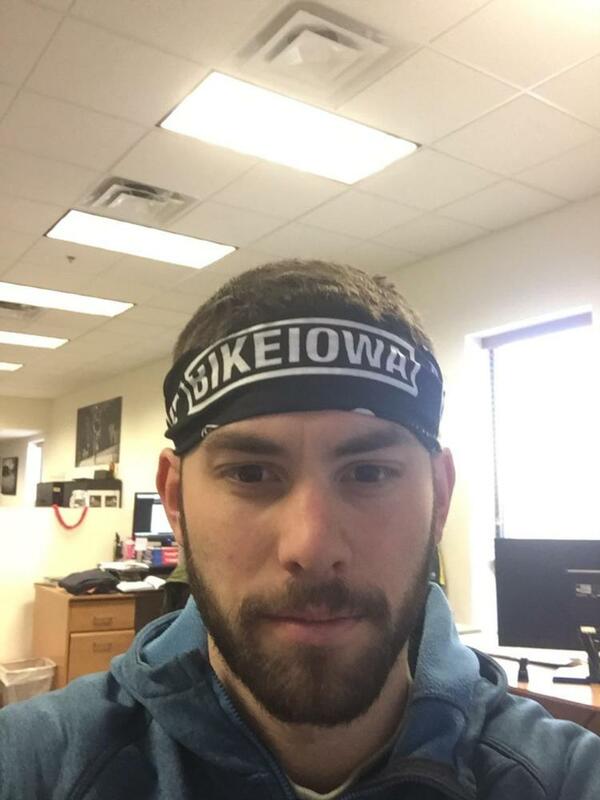 We BIKEIOWA... Do YOU? Please remember - We’re more than just t-shirts! Hosts the largest cycling event calendar in the Midwest!